We apologise for the relatively poor quality of the images on this page. This is due to the archive nature of the recording. In this episode of The Last Word, Michele appears as one celebrity contestant alongside Ken Kercheval from Dallas – at no time is Michele’s appearance in Dallas mentioned by anyone. This edition of the show continues on from the previous episode and so begins with a standard “three word” round between Ken Kercheval and Michele’s contestant. Ken Kercheval wins the “Last Word”. As this is a continuation from a previous edition, Michele’s opponents take part in the 60-seconds “against the clock” round, which they fail. 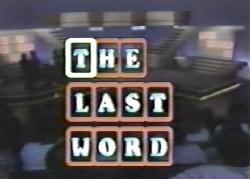 As the second segment of “three words” begins, both celebrities swap places which results in the first round being played between Ken Kercheval and Michele’s new contestant. Ken wins this round. FINALLY, Michele gets a look-in as she plays the second round against her opponent. This is a crucial round for, if she fails, her contestant will be out of the game – having already lost the previous round to Ken Kercheval. Michele identifies the first word – FISH – easily but the other words are more complicated. She loses the second word – CROWDED – to her opponent but then easily sneaks in with the last word of SARDINES. "It's been a dist inct pleasure all this week to have Michele Scarabelli from Alien Nation - the new series on 'Fox Network' this Fall. Procreation, I understand, on your show is most different... most unusual?." "Well, yeah we have a female writer who's written an upcoming script where it takes two males to every female to procreate..."
"...and I'm looking forward to it actually." "You remember that hit record a few years ago - it takes 'Two to Tango'..?" "Yes well actually the script is called 'Three To Tango'..."
"Yeah, funny you should mention it..."
"No comeback for that whatsoever - but I will be looking forward to watching that..."
Having won one game each, the two contestants play the third round of “three words” against each other. Michele’s contestant loses as time runs out on the show. Although Michele takes no further part in the show, she is seen to be discussing the game with her contestant and co-host Jennifer Lyall during the end title sequence.